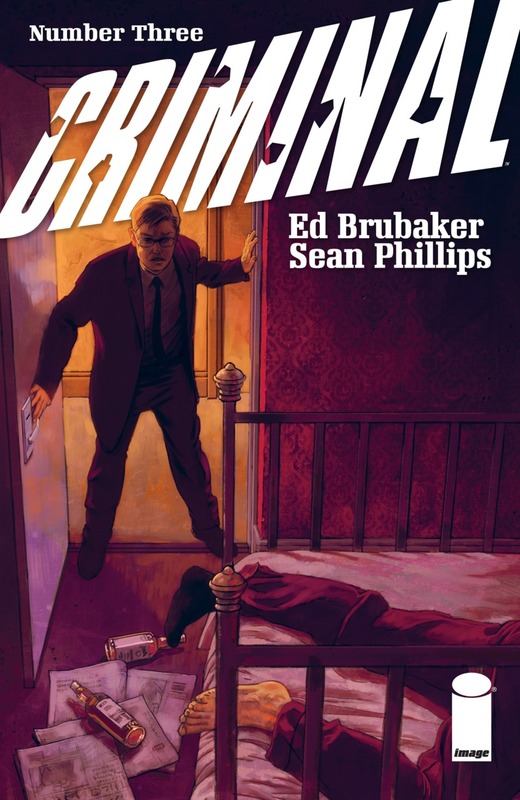 Criminal #3 – Is there a more masterfully put-together comic than Criminal? This issue wraps up the two-part storyline involving Hal Crane, a legendary comics creator who, at the end of his career, is more concerned with tracking down art that was stolen from him than he is with correcting his reputation. This issue has two truly surprising moments, and portrays the comics industry with a knowing love and reverence, while openly exploring some of the damage it has caused. Ed Brubaker creates such complex characters, and then puts them and the reader though the emotional wringer. I can see this issue and the one before being easy contenders for all sorts of awards this year. This is a phenomenal comic. Black Badge #8 – The troop has been sent home for a couple of weeks as a prize for winning the Jamboree, but that is not much of a gift when three quarters of the kids have nowhere really to return to. And, when they are under close surveillance by the White Badge, and are much more vulnerable on their own. This issue takes a pretty dark turn that surprised me. 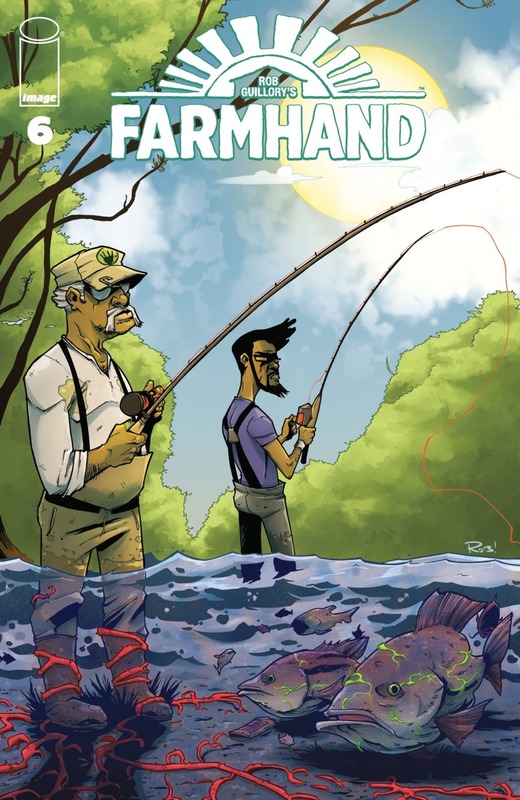 Farmhand #6 – I’m happy to see that Rob Guillory’s new and very bizarre series has returned for a new arc. There’s really no denying that the Jedidiah Seed has broken quarantine, just as many recipients of plant-based limb and organ transplants start showing up around town. Ezekiel is ready to start dealing with his issues with his father, who is surprised to see that his grandson has become friends with the child assassin sent to kill him. There’s a lot going on in this series, and it is all interesting. Guardians of the Galaxy #3 – This issue is very much a middle-of-the-arc issue, as Starfox’s Dark Guardians go after Nova to find Gamora, Star-Lord’s new Guardians decide to go against his wishes, and the Black Order find Thanos’s head. I like what Donny Cates is doing with this series, and I love Geoff Shaw’s art. I’m glad that this book has broken free of the need to replicate the Guardians movies, and is so tightly entwined with the rest of the cosmic aspect of the Marvel Universe. I do wish, for once, that things wouldn’t revolve around Thanos, but perhaps that’s asking too much. Incursion #2 – As much as I hate the Deadside, I’m enjoying this miniseries that has Gilad heading there to try to save Tama, the Geomancer, after a necromancer infected her, and through her the entire Earth, with a disease. This is one of Alex Paknadel’s first mainstream comics, after writing some impressive creator-owned independents. Doug Braithwaite’s art is always a welcome sight, and along with co-plotter Andy Diggle, they are giving us an exciting story. 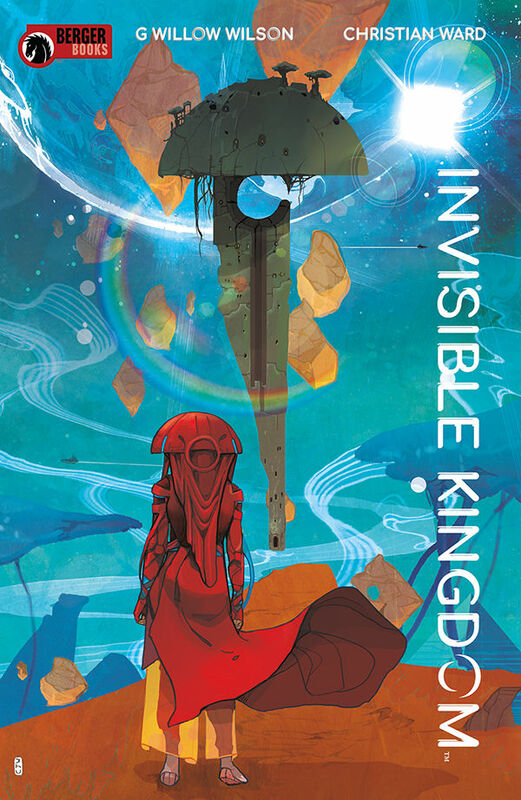 Invisible Kingdom #1 – I hadn’t paid attention to what this new series was going to be about, figuring that the names of G. Willow Wilson and Christian Ward were enough to get me to buy it. I was pleasantly surprised with what I found – a science fiction series that pulls together questions about religion, massive retail monopolies, and the quest for fulfillment through either means. Grix is the captain of a cargo vessel that moves packages for Lux, this world’s Amazon. Vess is an initiate into the dominant religious order, and she comes from a world that makes her uncommon on the system’s main planet. Moreso, her gender makes her more of a rarity, and that makes fitting into the order of things difficult for her. Both women make a discovery about their different callings, and it looks like this is where the story is going to be coming from. Wilson is a great writer, and I’m happy to see her doing creator-owned work again (I loved her Air). Ward’s work is always beautiful, but it seems that his storytelling has improved to the point where I found this issue very smooth to read, something I haven’t always found with his stuff. This looks like an intriguing series, and I’m thankful for Dark Horse’s Berger Books line, where unique ideas get a platform. 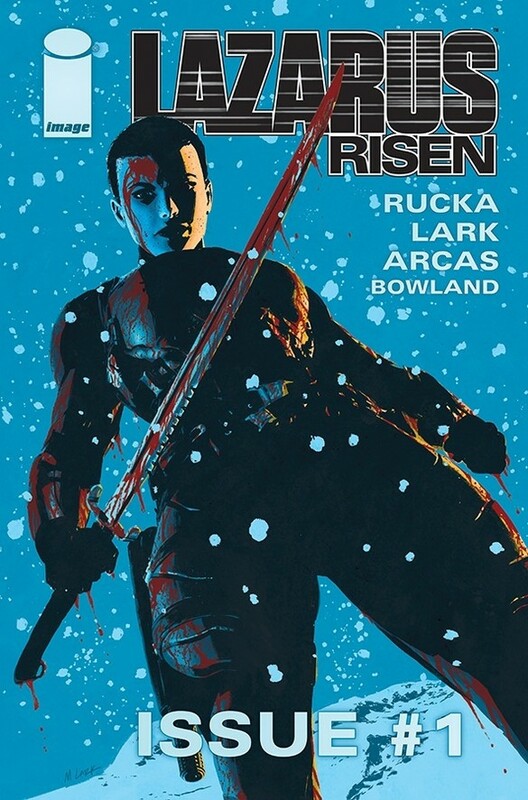 Lazarus Risen #1 – I’m very happy with this new, thick format for Greg Rucka and Michael Lark’s excellent series Lazarus, except for the fact that the book is going to be quarterly now. Rucka and Lark move time forward a few years, and while the Carlyle family is still at war, and not in the best position within it, Forever has taken a lot more control of her life. The expanded format allows for more space in the story, and is supplemented with a good prose story by Lilah Sturges. I’m sure the quarterly format will be brutal for people who are trade waiting, but I can get used to it when the quality, especially of Lark’s art, is this good. The Life and Death of Toyo Harada #1 – Joshua Dysart’s Harbinger series was very good, and his follow-up, Imperium, was absolutely incredible, one of my favourite comics in the short time it was being published. Now, Dysart has returned to Valiant and to Toyo Harada to continue the long story he started years ago. Reading this, it really is just the next issue of Imperium, as Harada, his Foundation, and his bizarre collection of non-psiot operatives work to build a space elevator, while Coalition forces, commanded by Rising Spirit, work to stop him. A lot of this stuff hasn’t been reflected in recent Valiant continuity, where Harada and Harbinger stuff has been given wide berth, but in many ways, I’m happy about that because it means that Dysart hasn’t had to alter his story much. This is not a very new-reader-friendly comic, but it is a very good one. 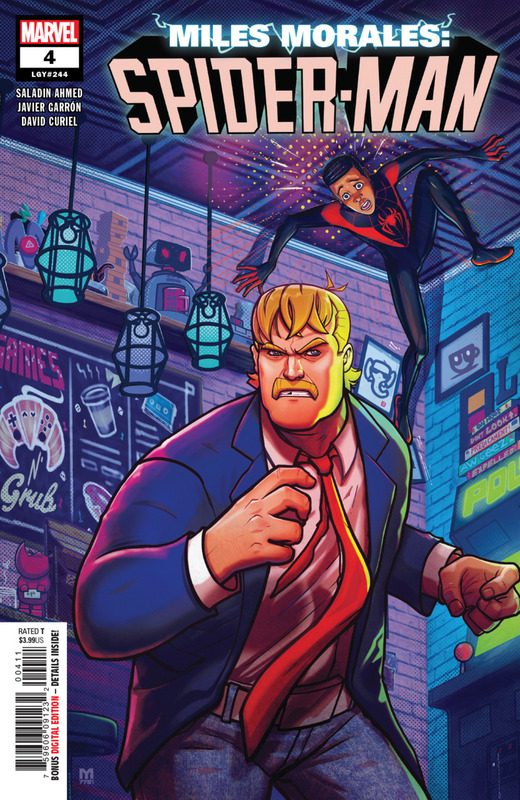 Miles Morales: Spider-Man #4 – Saladin Ahmed and Javier Garrón take Miles and his friends on an homage to Ferris Bueller’s Day Off, as their creepy vice-principal decides to prove that they’re skipping school. It’s a fun issue that helps to advance Miles’s relationship with Barbara, and recaptures some of the fun of early Miles comics. It’s good, although I’m not sure what the hell he’s wearing half the time. Star Wars #63 – One thing that Kieron Gillen excels at in his Star Wars comics is setting up a big mission so that its execution ends up feeling like a solid heist movie. Leia and her team make their move on Shu-Torun, although to carry out the mission, they will need to carry off three separate things almost at the same time, and there is a lot of space for something to go wrong. It’s a fun comic, with great art by Angel Unzueta (who draws an especially good Carrie Fisher). Teen Titans #28 – It’s time for the Teen Titans to once again crossover with Deathstroke, so it’s time for me to buy that title again, at least temporarily. It seems that Robin has a team of characters I don’t know anything about, alongside Kid Flash. I assume that Red Arrow is Oliver Queen’s little sister, but the others are mysteries to me. It also appears that Robin is running a secret prison beneath their base, and now he wants to add Deathstroke to his collection. It’s hard to believe that a team this young could nab Slade, so I know there’s a lot more going on than what appears in this first chapter. I don’t find myself too interested in whatever this series is usually about under Adam Glass’s control, but I do like Bernard Chang’s art. 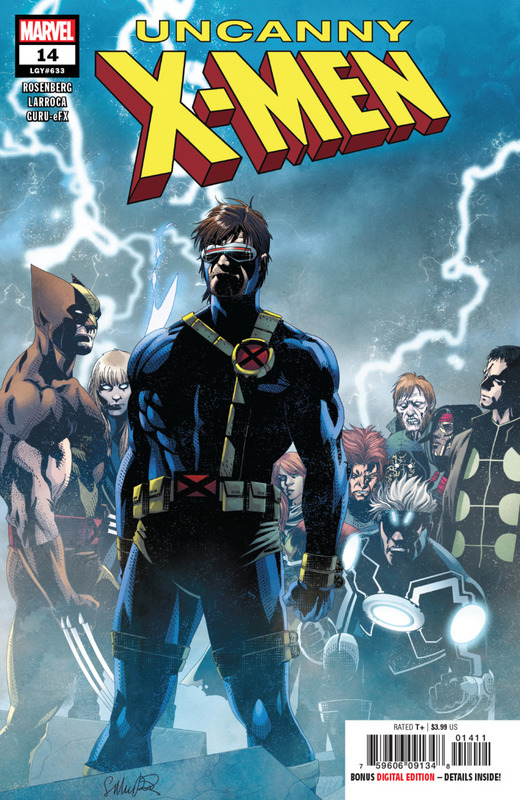 Uncanny X-Men #14 – I think that this arc is finally starting to grow on me. Matthew Rosenberg returns to Chernya, the country that has shown up in just about all of his Marvel work in one way or another, and has the team interacting with former MLF and Maraurders members in their quest to work their way through Cyclops’s list of enemies. I like the darker tone of this run, and the focus on clearing up what some minor characters have been up to. The Warning #5 – After months of build-up, this alien invasion series hits high gear. After an orbital attack on the alien beachhead, three objects were launched, one of which lands on the base where the operation is being run from. Edward Laroche has taken an unconventional and pretty decompressed approach to this story, but I feel like it really works well. There are a lot of cool action sequences in this issue. Cosmic Ghost Rider #2-5 – Okay, so Cosmic Ghost Rider is the new Deadpool, but in some ways, I find him a lot less annoying. 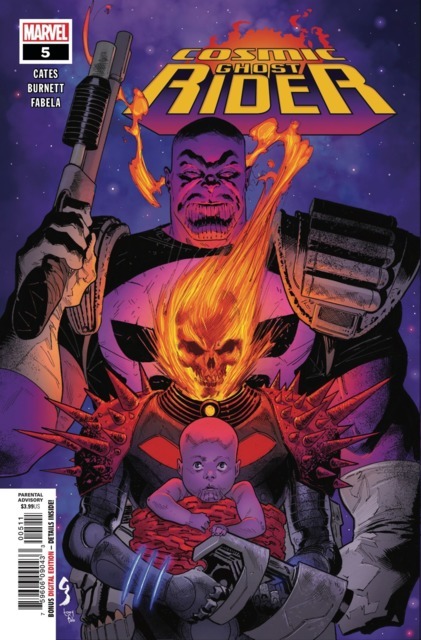 This miniseries has him choosing to abduct Thanos as a baby and raise him himself, although that leads to many unintended consequences. Basically, this series is a good introduction to Donny Cates’s more irreverent writing, and does a great job of showcasing the excellent Dylan Burnett’s art. I love his current X-Force work, and that is the main reason I picked these comics up. 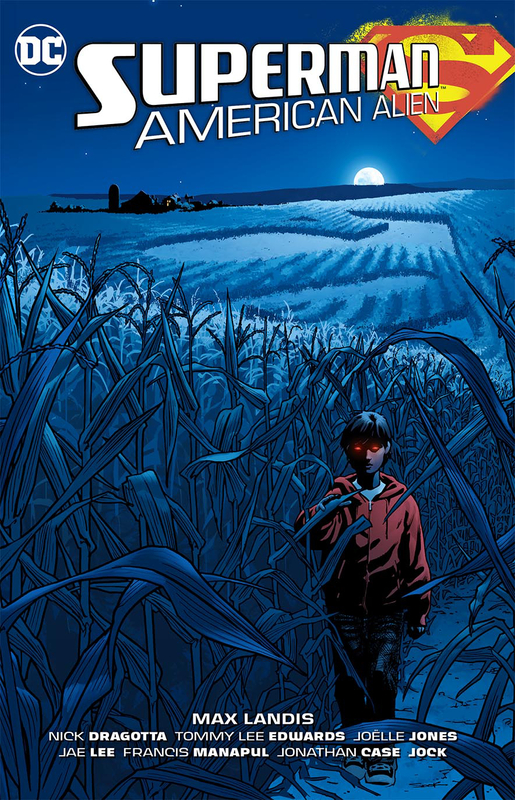 Superman: American Alien – I get easily bored by Superman comics, but I really enjoyed this out of continuity book written by Max Landis. In it, each chapter tells a one-off story about Clark Kent growing up and becoming Superman. It emphasises his sense of isolation as the sole member of an alien race on the planet, but also shows how he builds community around himself. Each issue had a different artist, and the list is pretty impressive – Nick Dragotta, Tommy Lee Edwards, Joëlle Jones, Jae Lee (on interiors! ), Francis Manapul, Jonathan Case, and Jock, who draws a Superman/Lobo fight that is pretty incredible. This was a cool book, and well worth checking out.